Our luxurious handmade shaving soap is made from pure natural ingredients. It is rich in natural oils which protects, sooths and moisturises the skin before during and after shaving. Coconut Oil provides gentle cleansing while Cocoa Butter and Vegetable Glycerine leave the skin conditioned and smooth. Our shaving soap has been carefully formulated to produce a long-lasting dense lather which ensures a close, smooth high quality shaving experience. Natural Shaving Soap is mild and suitable for all skin types including sensitive skin. No SLS, parabens, mineral oils, alcohol etc. Enjoy an almost perfect shaving experience with our handmade shaving soap made from essential oils and natural ingredients. Our luxurious handmade shaving soap is made from pure natural ingredients. It is rich in natural oils which protects, soothes and moisturises the skin before during and after shaving. Coconut Oil provides gentle cleansing while Cocoa Butter and Vegetable Glycerine leave the skin conditioned and smooth. Our shaving soap has been carefully formulated to produce a long-lasting dense lather which ensures a close, smooth high quality shaving experience. Natural Shaving Soap is mild and suitable for all skin types including sensitive skin. Our traditional luxury natural shaving soap is the result of meticulous research and development. 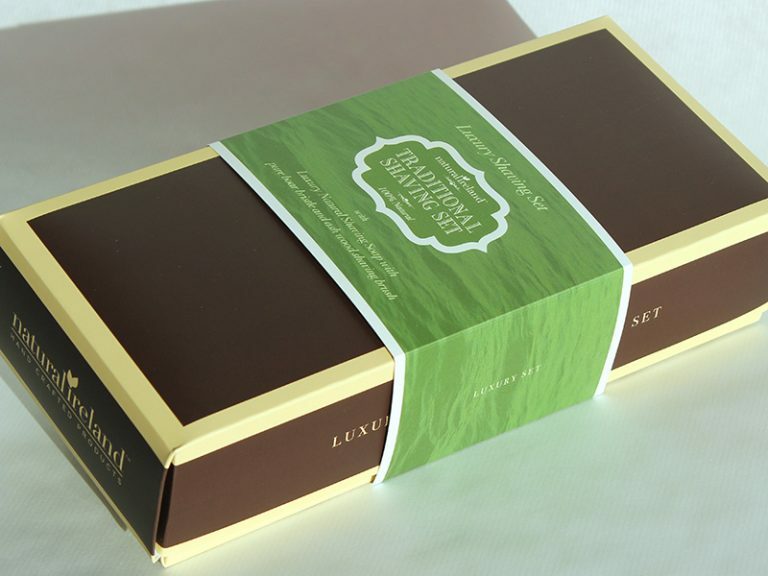 It is a semi solid, luxury lathering, skin friendly soap. It has been carefully formulated to produce a fine, cushioning and long-lasting dense lather which provides a protective barrier between the skin and the razor ensuring that your skin is protected from razor burn and irritation. This dense lather protects the skin during shaving. This soap is made from 100% natural ingredients including a mixture of oils and butters which are naturally moisturising for the skin. Coconut Oil provides gentle cleansing while Cocoa Butter and Vegetable Glycerine leave the skin conditioned and smooth. Our shaving soap also harnesses the benefits of Irish seaweed which contains a wealth of essential vitamins, minerals, amino acids and antioxidants that helps to keep the skin revitalised, moisturised, and nourished Our Irish seaweed is sourced in Donegal along the Wild Atlantic Way. Our natural shaving soap is semi-solid soap which makes its practically unique in the marketplace as most shaving soaps are solid. In our opinion there is no comparison in terms of the shaving experience, as a semi solid soap will deliver a much superior shaving experience. 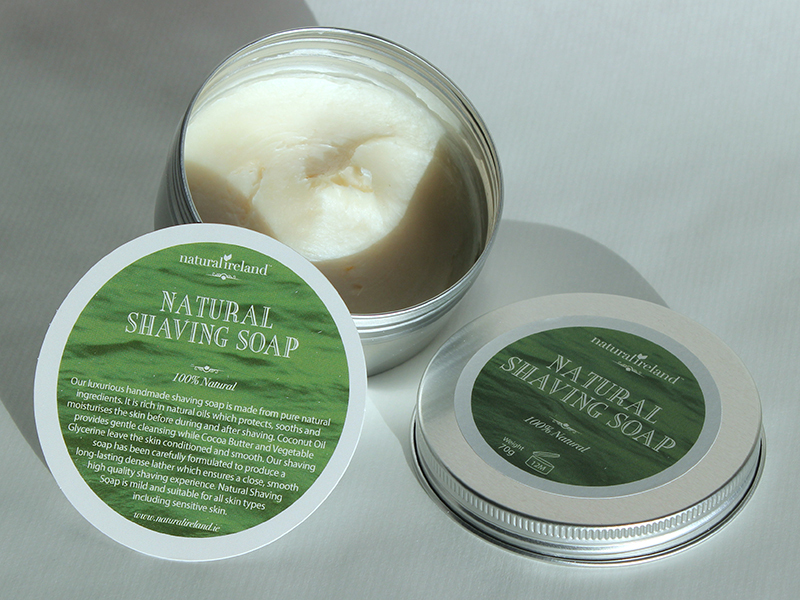 Even sensitive skin won’t be irritated by our mild natural shaving soap . Our customer feedback proves to us that if our soap is used consistently over a number of weeks there is a definite improvement in many skin conditions. To get the full benefits of this natural shaving soap we recommend that you use only our shaving soap consistently over a number of weeks. We recommend that you do not use our natural product in combination with other chemical based commercial products as they will negate all the benefits gained.